A good heavy cropping dessert variety suitable for wet regions. Raised by Spinks at Long Ashton Research Station, Bristol, UK 1920 and introduced in 1931. Grown commercially on a small scale in the past. Medium sized, oval pyriform to calabasse shaped fruit. Yellowish green skin. 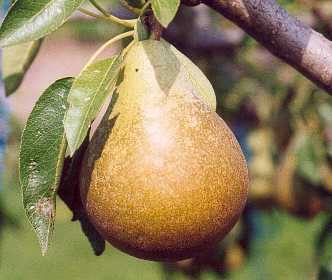 Variable amounts of green or brown russet with some fruit almost entirely covered and some almost entirely clean. Yellowish white, slightly granular, juicy flesh. Sweet fine flavour. Very heavy cropping variety. Good in wet areas and on heavy soils. Very poor pollinator of other varieties.